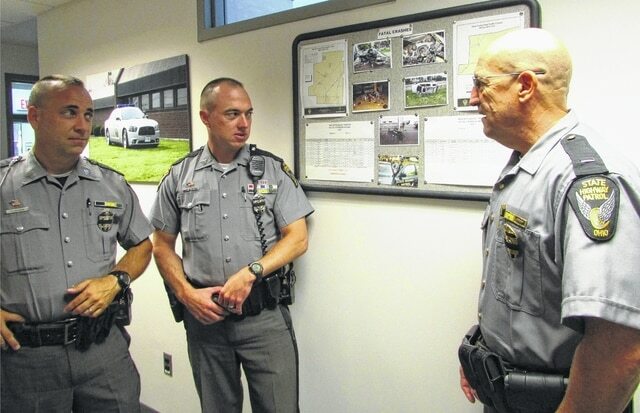 Donna Carver | Morrow County Sentinel Lt. Leach, far right, discusses the OHP fatal crash board with Sgt. Flanagan, far right and Sgt. Niemeyer. The Mount Gilead Post 59 has investigated 5 traffic fatalities so far this year in Morrow County, 4 of the 5 were mature unrestrained drivers. Seatbelts save lives. There is no question about that. They also can reduce the severity of injuries in an accident. Surprisingly, the majority of unrestrained drivers are mature drivers over the age of 57. According to the Mt. Gilead Post of the Ohio Highway patrol, they responded to 11 fatal accidents in 2014 in Morrow and Knox counties. Of the 5 fatal accidents in Morrow County, 4 of the 5 were mature drivers. 80% were unrestrained. In 2014 of the (11) fatalities, (6) fatal victims (55%) were over the age of (57) years old. For the mature driver they were at fault in all (5) crashes they were involved in. Alcohol was not a major issue in the 2014 fatal crash picture. There was (1) youthful crash driver at fault. There were (2) motorcycle crashes both at fault/no helmets. There were (4) fatal involving commercial vehicles (2)at fault. (7) of the (I l) fatal victims were not wearing safety belts. 2015 There have been 4/7 fatalities in Morrow County and 1/6 in Knox County. Post 59 2014 provided a Fatal Crash Summary for Morrow & Knox Counties. Recommendations to reduce distraction driving: Limit cell phone use when driving, keep both hands on the steering wheel, be careful when looking down to change the radio, give yourself enough space between the vehicle in front of you, give yourself enough time so you are not running late, when transporting children don’t reach back pull over and finally be active and stay healthy and get proper rest. Please be safe this holiday season. Buckle up and save a life.